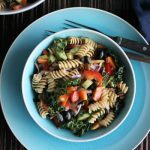 If you are making this pasta salad for a picnic, mix in the salad dressing right before you serve it. Cook pasta according to package instructions and cook to al dente. Rinse and allow to cool. In a large mixing bowl, mix together the cooled pasta with all of the chopped veggies. Pour in the salad dressing, sprinkle on the sunflower nuts and mix again. Serve immediately.